What was the exegetical basis of this patristic doctrine that the Son’s nature is derived from the Father? Were the fathers correct in their handling of the biblical data? How should we conceptualize this eternal generation – as a communication of essence, or merely of personal properties? And if this doctrine is Scriptural, how do we harmonize it with Calvin’s concern to uphold the aseity of the Son? These are the questions I wish to examine in this paper. Further support may be marshaled from I John 5:18, which, though it does not use the word, shows that John taught that the Son is begotten of God: “We know that anyone born of God does not continue to sin; the one who is born of God keeps him safe, and the evil one cannot harm him.” It seems reasonable to suppose that “the one who is born of God” is the Son of God. Some follow the textual variant “keeps himself” and see this as referring to the believer. However, this would lead to a redundant statement. It seems likely that John is pointing to the similarity between two sonships – that of the believer and that of Christ. Christ, of course, is the Son by nature, and we are sons by grace. But the point is that the ontological Son of God will protect the adopted sons of God from the evil one. Although it would be dangerous to make too much out of the different tenses (aspects) used, the distinction may be signaled by the fact that the believer is ho gegennemenos of God (perfect), while Christ is ho gennetheis(aorist). Be that as it may, the fact that the verb gennao is used in this context at least suggests the idea of generation. It also adds credibility to the traditional etymology of monogenes (mono + gennao) by providing at least one text where gennao is used in reference to Christ’s sonship. Some have felt that the New Testament interpretation of Psalm 2:7 (“You are my Son; today I have begotten you” – a traditional proof-text) requires that the begetting of the Son be seen as occurring in time – at his resurrection (cp. Acts 13:33; Heb. 1:5; 5:5). However, I would suggest that the historical begetting of the Son (at the resurrection) is organically related to and, in fact, founded upon the eternal begetting. If we take it as a given that the Son was always the Son even before his incarnation, then those passages which speak of the resurrection as the moment when he was “designated (or appointed) the Son of God in power” (Rom. 1:4) cannot be pressed into the service of a conclusion which would contradict the eternality of his sonship. However, neither would it be permissible merely to ignore or suppress them. What do these passages mean, then? My suggested solution is to take note of the request of Christ to his Father: “And now glorify me, Father, in your presence with the glory which I had with you before the world was” (Jn 17:5). There is continuity between the primeval, pre-incarnate glory of the Son and his redemptive historical, resurrection glory. The Son was raised from the dead and designated to be the Son of God in power, because he was the eternal Son of God. Thus, only the Son of God could rightfully have been “begotten” on the day of his resurrection, that is, anointed as the Messianic king (II Samuel 7:14 shows that the “begetting” of Psalm 2:7 is not an ontological generation but a functional appointment to kingship). The eternal generation of the Son is ontological, while the historical generation is redemptive historical; but the latter is appropriate only because the former is a reality. But is it really? In John 8 (the locus classicus for Jesus’ claim to that divine name), we read this interesting statement: “So Jesus said, ‘When you have lifted up the Son of Man, then you will know that I AM. And I do nothing on my own but speak just what the Father has taught me. The one who sent me is with me; he has not left me alone, for I always do what pleases him. '” (vv. 28f). If self-existence and filial subordination are incompatible, then why does Jesus seem to expound “I AM” in terms of his being taught of, sent by, and pleasing to his Father? It is clearly his relationship of dependence upon his Father that Christ wishes to highlight. Hodge adds another argument: derivation of essence is not essential to the concept of sonship. When the Bible declares that the relationship between the first and second persons of the Trinity is that of a Father and a Son, the point of this analogy is not communication of essence but a peculiar relationship of reciprocal affection. However, it would be more accurate to say that both aspects (communication of essence and relationship of love) seem to be involved. An example of the former can be seen in that well-known passage, John 10, where Jesus makes the astounding claim, “I and my Father are one” (v. 30). Several verses later Jesus restates his initial claim in different words: “I am the Son of God” (v. 36). Thus, the title “Son of God” and the claim “I and my Father are one” seem to mean the same thing. There is an ontological and not a merely social (or relational) element in Christ’s claim to be the Son of God. Let us return to Calvin’s argument for a moment. Assuming that both are true, how do we harmonize the aseity of the Son with the doctrine of eternal generation? If the Son is eternally generated by the Father, then he is a derivative being, dependent on another for his existence. It would seem inescapable, therefore, that he is no longer a se. How are we going to resolve this dilemma? Calvin attempted to resolve the problem by claiming – as we have seen – that the eternal generation of the Son only implies a communication of the personal property of Sonship, not a communication of divine essence. If the latter were the case, then, Calvin assumed, the deity of Christ would be a derived deity and hence no true deity at all. By making the Son’s generated-ness a personal rather than an essential property, he thereby sought to eliminate the idea of derived deity. Calvin’s concern to affirm the Son’s autotheotes (his God-of-himself-ness) is thus in the interests of maintaining his full ontological equality with the Father (homoousion). Turretin agreed with Calvin that the true deity of Christ necessarily dictates that the Son be autotheos. Yet Turretin also taught that the eternal generation of the Son involved a communication of essence. Thus, Calvin’s solution was not open to him. So Turretin resolved the problem by asserting that aseity is properly attributed to the Son’s divine essence not to his person. The Son has the divine essence from itself as God but not from himself as Son. The eternal generation of the Son involves a communication of the divine essence to the Son from the Father, not the generation of a new essence. As a result the Son’s divine essence, which flows from the person of the Father, is not derived from another essence and is therefore a se. Turretin goes on to point out that this generation is not to be understood as the divine essence generating another divine essence (for that would involve tritheism), but as the person of the Father generating the person of the Son in a manner that involves the communication of essence. Second, such language is unavoidable in any sound doctrine of the Trinity. For we do not maintain that there are three divine beings, but one God in three persons. Were we to argue that the three persons of the Godhead each had aseity in the sense that each had its own divine essence independently of the other two, would we not be committed to tritheism? If so, then we cannot escape the notion that these three hypostases must be related to one another in a way that involves dependence or derivation. But then derivation is the opposite of aseity. On the one hand, we must affirm that each of the three persons has the same divine essence, or that each of these persons subsists within the unity of the Godhead. And since that divine essence in which all three share must be underived (a se) if it is to be truly divine, we are thereby forced to conclude that all three hypostases share in that quality of aseity. But on the other hand, we must avoid saying that they have that quality of aseity independently of the others. Otherwise we are committed to three, independently a se, divine beings. Thus we say that they share in the quality of aseity, just as they share in the one undivided divine essence. But the mode of that sharing is eternal generation for the Son and eternal spiration for the Spirit. It would appear to be unavoidable, therefore, to assert the paradoxical notion of a divine person whose derived deity partakes of the quality of being underived! The Son’s divine essence is not from himself, yet that essence is not from another essence but from the Father, such that the Son’s essence is a seand from the Father at the same time. Hence, the Son derives the divine attribute of inderivity (aseity) from the Father! May I remind you that this odd language is strikingly similar to the teaching of Jesus himself, “Just as the Father has life in himself, so he has granted the Son to have life in himself” (John 5:26). Recall my appeal to John 8:28f against Calvin’s argument. I noted that the claim “I AM” is found in a context that emphasizes the Son’s submission to the Father. Once again, then, we see that there is no ultimate conflict between the two ideas: it is precisely because the Son does and says nothing on his own initiative (i.e., because he is totally dependent on his Father) that he can claim aseity. The Son is God-of-himself because he is the only begotten God. Note, however, that we do not have a formal contradiction, because derive is being used in two different senses. When we affirm that the Son is derivative, we refer to the communication of divine essence from the Father to the Son in the act of eternal generation. When we deny that the Son is derivative, we are claiming that the divine essence as possessed by the Son is not derivative from any other essence outside itself. This is Turretin’s solution. Even if a residual feeling of discomfort remains, I can’t see any other way of reconciling the two doctrines of eternal generation and the autotheotes of the Son that remains faithful to the total teaching of Scripture on this subject. If Calvin’s view that the generation of the Son involved only the communication of personal properties is correct, then it would be fair to ask, “What are those personal properties?” He certainly would not be able to use the language of the Westminster Larger Catechism: “It is proper to the Father to beget the Son, and to the Son to be begotten of the Father, and to the Holy Ghost to proceed from the Father and the Son from all eternity” (WLC # 10). But were Calvin to attempt to find any other language that would distinguish the three persons, he would be going beyond Scripture. Therefore, it is necessary for us to affirm that the generation of the Son and the procession of the Spirit involve the communication of the divine essence. The mode of communication (generation or procession) is the only characteristic that is proper to each person. As to the difficult question of what constitutes the difference between generation and procession, I would rest content with saying that generation is from the Father, while procession is from the Father and the Son (filioque). To go beyond that is to go beyond Scripture. The key sentence here is “begotten of the Father as only begotten.” It is clear that monogenes is a precision further defining gennethenta, which clearly implies that the framers of the creed interpreted the Johannine monogenes in the traditional sense as deriving from gennao. But, what is more, the word order of the Creed of Nicaea (which is not reflected in the revision of 381 at the Council of Constantinople) undeniably indicates that the fathers at Nicaea understood this generation of the Son to involve a communication of the divine essence, for the very next clause reads, “that is, of the ousia of the Father, God of God, etc.” Therefore, the fathers of Nicea seem to have believed that the biblical teaching regarding the generation of the Son (as indicated by the term monogenes) was powerful evidence that he is homoousios with the Father! To conclude, the doctrine of the eternal generation of the Son, understood as involving the communication of the divine essence, is not only the historic position of the church, but it is a biblical doctrine essential to an orthodox formulation of the doctrine of the Trinity. B. B. Warfield, “Calvin’s Doctrine of the Trinity,” in Calvin and Augustine, ed. Samuel G. Craig (Philadelphia: Presbyterian and Reformed, 1956), pp. 189-284. Cornelius Van Til, A Survey of Christian Epistemology (Phillipsburg, NJ: Presbyterian and Reformed, n.d.), p. 101. Van Til depends heavily on Warfield’s interpretation of Calvin. However, it should be noted that Van Til’s position is more radical than Calvin’s. Hilary of Poitiers, De Synodis 84. Dale Moody defends the RSV’s translation of monogenes in “God’s Only Son: The Translation of John 3:16 in the Revised Standard Version,” Journal of Biblical Literature 72 (Dec. 1953) 213-19. Richard N. Longenecker goes to bat for the NIV in “The One and Only Son,” in The NIV: The Making of a Contemporary Translation, ed. K. Barker (Grand Rapids: Zondervan, 1986), pp. 119-26. Those who use etymological considerations to support their revisionist exegesis would do well to remember that arguments from usage are far more relevant than arguments from etymology. James Barr, The Semantics of Biblical Language (Oxford: Oxford University Press, 1961). A comprehensive study of the usage of monogenes supports the traditional translation. John V. Dahms, “The Johannine Use of Monogenes Reconsidered,” New Testament Studies 29 (1983) 222-32. For more on the textual variants in John 1:18, see Bruce M. Metzger, A Textual Commentary on the Greek New Testament, Second Edition (Stuttgart: Deutsche Bibelgesellschaft, 1994), pp. 169-70. J. N. D. Kelly, Early Christian Doctrines, Fifth Edition (San Francisco: HarperCollins, 1978), p. 244. Francis Turretin, Institutes of Elenctic Theology, vol. I (Phillipsburg: Presbyterian and Reformed, 1992), pp. 292-93. Charles Hodge, Systematic Theology, vol. I (Grand Rapids: Eerdmans, 1993), p. 467. Turretin, vol. I, p. 291. Robert Dabney, Systematic Theology (Edinburgh: Banner of Truth, 1985), p. 209. A precision is a word which further defines and interprets another word to which it is in grammatical apposition. Oskar Skarsaune, “A Neglected Detail in the Creed of Nicaea (325),” Vigiliae Christianae 41 (1987) 34-54. Hilary of Poitiers, De Trinitate XII.24. B. B. Warfield’s 1915 ISBE article on the Trinity presents the Princeton theologian’s mature thinking on the biblical bases and meaning of the doctrine and offers a revisionist interpretation of the personal names of “Father,” “Son,” and “Spirit.” Instead of interpreting the personal names of the Trinity in terms of relations of origin, Warfield argues that the personal names only signify likeness between the persons. The present article locates Warfield’s revision within its immediate and broader historical contexts, critically engages Warfield’s proposed revision, and discusses the importance of a traditional interpretation of the personal names for Trinitarian theology. Author squeaky2Posted on April 25, 2018 Categories postLeave a comment on Does God Need Justifying? The link to the British Museum story appears at the end of this post. Researcher Mathilde Touillon-Ricci takes us into the secret world of Assyrian smugglers and merchants, 4,000 years ago, and reveals some of their cunning plans to avoid paying taxes! 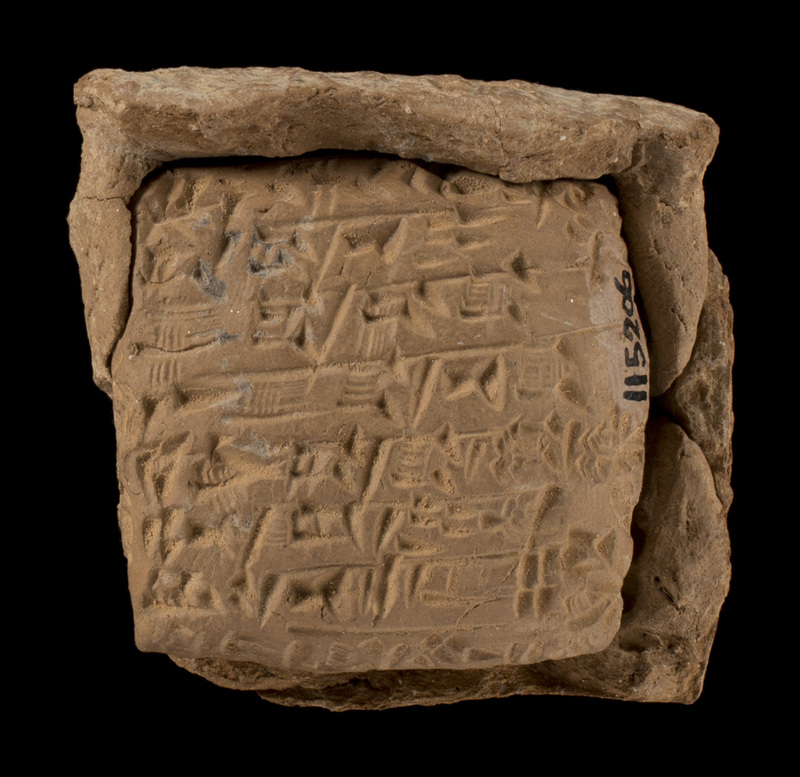 Old Assyrian letters on cuneiform tablets written around 1900 BC. Whenever I am asked what I do for a living, I have to confess: I read people’s private papers. In my defence, I have to say that any secrecy on these papers was lifted a few thousand years ago. These are not even made of paper but were shaped out of clay 4,000 years ago by travelling merchants along the roads of Mesopotamia and Anatolia. Around 1900 BC, the kingdom of Kanesh and the city-state of Ashur, in modern-day Turkey and Iraq respectively, enjoyed a deep and special partnership against a backdrop of trade agreements and the circulation of goods and people. Old Assyrian merchants, as we call them, exported textiles and tin to Anatolia to be exchanged for silver, gold and copper. This was one of the first long-distance trading enterprises. To facilitate this trade, it was common for merchants to move from Ashur to Kanesh. There they settled more or less permanently in the lower town, forming what we could recognise as an expat community. To sustain their long-distance activities, the merchants needed to communicate. 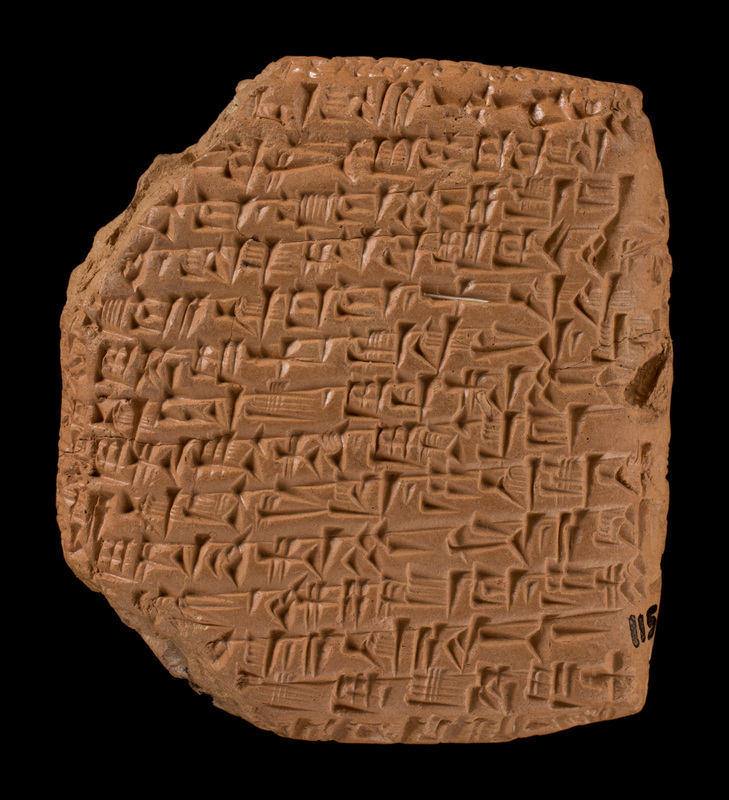 4,000 years ago, the most efficient and fastest information sharing devices were inscribed tablets. Shaped out of clay by hand, tablets were impressed with a stylus while the clay was still soft. Once dried out, they were wrapped in a sheet of clay bearing the names of the sender and the addressee – in other words, an envelope. 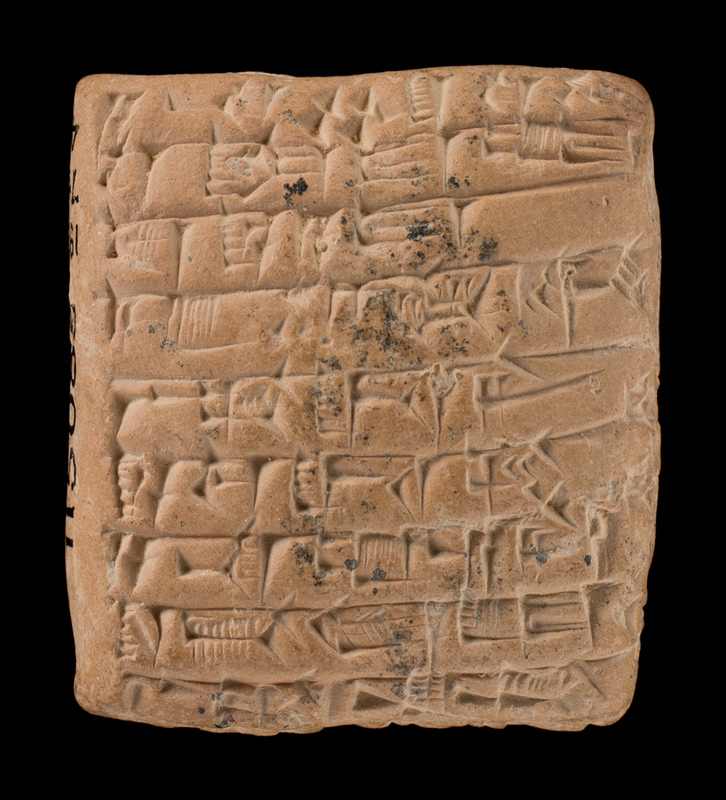 Archaeologists have found 23,000 of these tablets, from a period of about 150 years. The many letters merchants sent and received offer us a glimpse of what life would have been like in those days. 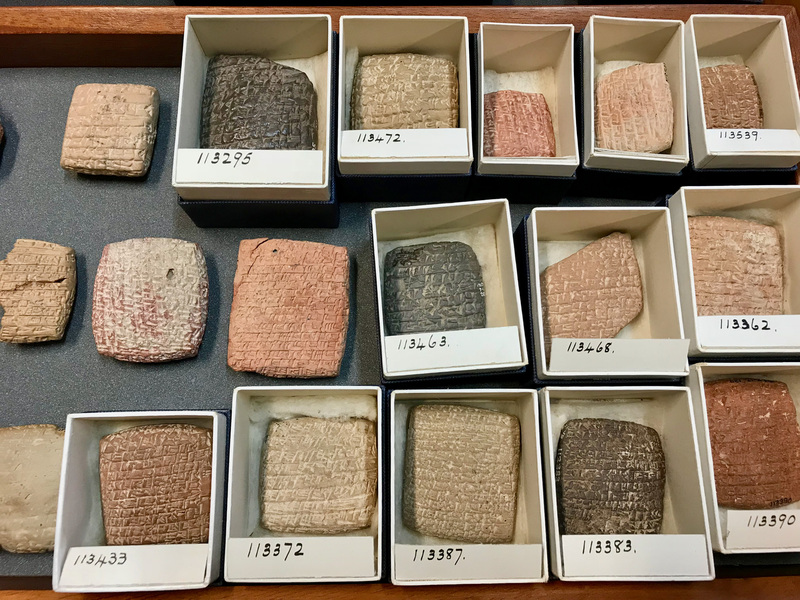 Having spent the last year studying these tablets, I have got to read some of their stories and it is always a thrill to sit down in the Museum’s study room and to walk down memory lane, albeit further down than I usually would. What I love most about Old Assyrian letters is their spontaneity. The introduction formula is kept to a minimum, ‘from so-and-so to so-and-so say this’, then comes the message in the first person. The message typically contains instructions from one merchant to his trading partner about the forthcoming shipment: the types and quantities of goods, their unit price and the applicable exchange rates, practical arrangements for the caravan and its staff in terms of accommodation and subsistence, even including the fodder for the donkeys. Let them [the transporters] bring the tin via the narrow track [smuggling route] if it is clear. If not, let them make small packets of my tin and introduce them gradually into Kanesh, concealed in their underwear. In this letter Buzazu actually cancels the smuggling operation after the situation had changed and was no longer favourable. Yet we are left wondering about the hows and whys of trade and contraband, not to mention the practicalities of concealing ingots of metal in one’s underwear. The agreement struck between Kanesh and Ashur regulated the activities of the trade in terms of authorised or prohibited goods as well as in terms of taxes to be applied to transactions. For example, iron – a rare and expensive metal costing up to 7 times the price of gold – and the lapis lazuli extracted from distant Afghanistan were sold under state monopoly. Mirroring these regulations, a system of contraband was set up, either to avoid paying the relevant taxes or in order to trade restricted products. Thanks to the letters they wrote, we know of some of the taxes Old Assyrian merchants were supposed to pay: transport and import taxes upon arrival in Kanesh, tolls and duties on goods and persons en route and an export tax upon departure from Ashur. Where there is a will there is a way, and for smugglers this was the ‘narrow track’. Going through the mountainous paths of Anatolia, merchants got around some of the taxes by taking a detour away from authorised routes and checkpoints. Lacking the protection offered on official routes, the journey was more perilous, exposed to wild beasts, highway thieves and a harsh climate. Smuggling also meant fooling the customs system either by not declaring taxable goods or by making a partial declaration. Along with the underwear trick elaborated by Buzazu, the merchants’ letters describe various ruses, whether that meant paying off the guards or hiring mules among the locals who would have known the place inside out. You are my colleague! Just as you send an order for your own goods to be smuggled, do also send one for my goods. Funnily enough, Pushu-ken happens to have been the father of Buzazu. Old Assyrian trade was a family business and we can still read the correspondence between Buzazu and his relatives: his mother Lamassi, his sister Ahaha, his brothers Sueyya, Ikun-pasha and Ashur-muttabbil. Sueyya, the eldest son, grew up and went to school in Ashur while Pushu-ken had already settled a thousand miles away in Kanesh to oversee the activities of the family firm. 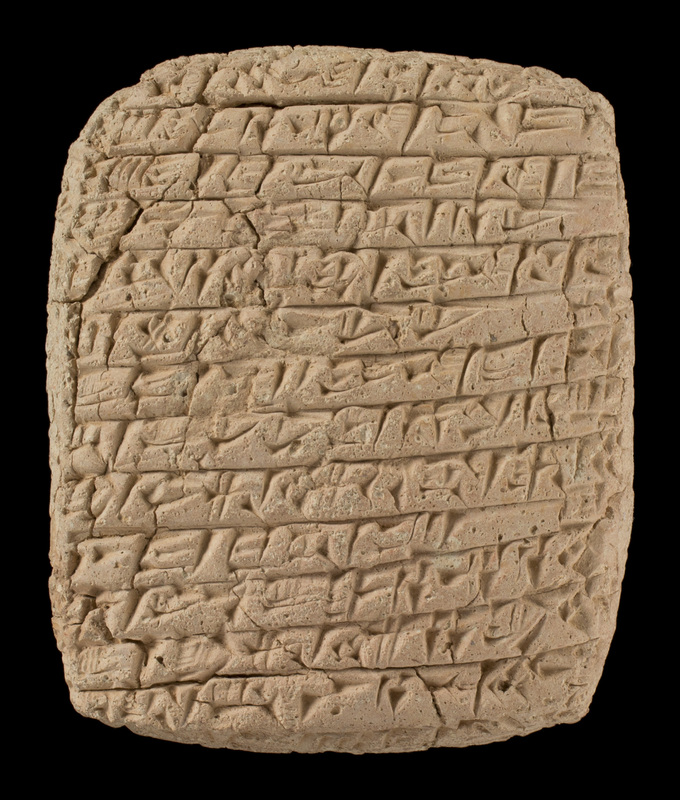 One of the most touching letters was written by the young Sueyya to his father, boasting about his learning of cuneiform and demonstrating it with neat and careful writing. 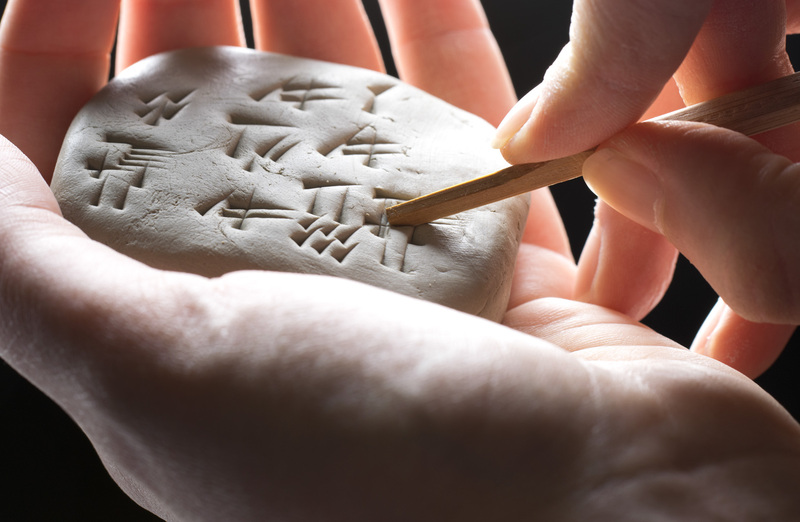 The tablets written by Old Assyrian merchants are their private papers, recounting in the first person what they did, what they wish they had done and what they shall do, in life and business alike. So whenever I am asked what I do for a living, I have to confess: I listen to people’s accounts of their lives in their own words. I read the tablets they wrote 4,000 years ago, fascinated by the stories of the life they lived. And what a life they led! Have you ever noticed the enormous emphasis on social ethics in Islam and Rabbinical Judaism? Jewish philosophers are generally social commentators and existentialists. They don’t focus on God the way Christian philosophers and theologians do. To the extent that they talk about God, it’s God as the source of morality. Same thing with so much Islamic discourse. In that regard it’s not coincidental that Islam and Rabbinical Judaism are militantly unitarian. Anti-incarnational. Because the Deity of Islam and Rabbinical Judaism is not an essentially interpersonal being, because the idea of a divine Incarnation is inimical to their theology, the Deity of Islam and Rabbinical Judaism is very abstract. Inscrutable. Ineffable. The result is to collapse the vertical dimension of religion to the horizontal dimension. We’re reduced to immanence. Human relationships. That’s because a unitarian Deity isn’t very relatable. From above, he creates and sustains a moral and metaphysical framework. And that’s about it. A unitarian Deity isn’t very engaging, approachable, or sociable–unlike an Incarnational, Trinitarian Deity. A religion of rules that never rises above human social dynamics. A unitarian Deity can be a benefactor, but not a friend or father. The chief weakness of Christianity is and always has been its sometime willingness to acquiesce to the demands of society in order to find acceptance, ‘tolerance’, or whatever. From time immemorial, as soon as the Church has agreed to the world’s terms, it was weakened. As Adolf von Harnack noted, the Church’s mission was to go into the world but instead the world came into the Church (in the era of Constantine the Foul), and that was when disaster struck. In our own time churches are caving in to the cravings of culture and ‘giving the people what they want’ instead of what they need- the Gospel. Nothing could be less appropriate, or less Christian. Accordingly, it really is time for Christianity to say to the World: this is who we are, this is what we believe, this is how we behave, and if you don’t like it or want no part of it, good riddance. Enough of the pandering and the whining and the capitulating; enough of the lying! The Church needs to be the Church and remember that as the Bride of Christ the very gates of Hell cannot prevail against it. Why, then, should a whiny Millennial? Or a sniveling ‘seeker’? Church, just be the Church, and to Hades with those who demand you surrender. The world needs the Gospel. The Gospel doesn’t need the world. Pastors need to be Pastors, not capitulaters.